Need a new recipe for dinner this week? Well I’ve got you covered! This is a delicious casserole that the whole family will love and anyone can make! It’s something I’ve made from time to time, but I’ve really been craving Italian and Mexican a lot these days. Being halfway through my pregnancy at this point, these cravings were bound to happen sooner or later I suppose. This last week I wanted to do a pasta dish. You’ve heard of Chicken Tetrazzini, right? Well, I decided to turn it into Turkey Tetrazzini and it was yummy! I try to simplify things when I can and I found a Turkey breast in the rotisserie section at my grocery store. So it was perfect! All I needed to do was grab a few other ingredients and get to cooking. I wish you could smell and taste through the pictures! This bowl was empty in a flash because it was so good! 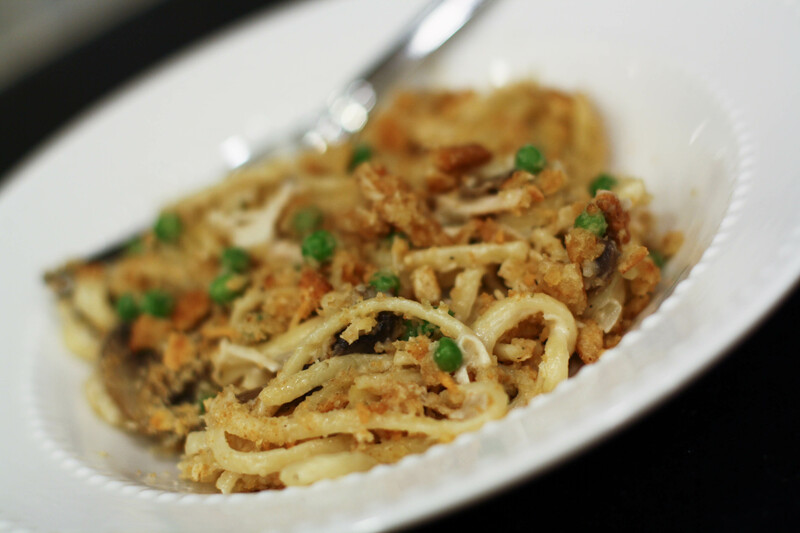 The recipe could easily be converted to Chicken Tetrazzini if you don’t have turkey on hand. If you find it’s a little too thick for your taste once you’ve combined all of the cooked ingredients in the mixing bowl, just add a little pasta water or chicken stock. If you love pasta and comfort food, this is a definite must! All ya need is some garlic bread and sweet tea and you’ve got yourself a great meal! Hope y’all enjoy! I know we did! Bring large pot of water to a boil. Add linguine and olive oil . Cook until tender and drain liquid, reserving ¼ cup of pasta water. Pull turkey from the bone and shred. Place in bowl to the side. Dice onion and garlic into finely chopped pieces and cut button mushrooms into slices. Add 4 Tbsp of butter to pan on medium heat and throw in the onion, garlic and mushrooms. Stir until butter has melted and coated all ingredients. Add ¼- ½ cup chicken stock and stir. Once the liquid has evaporated, the onions are translucent and mushrooms are tender, remove from pan and place with turkey. Add 4 Tbsp butter to same pan that is now empty. Once melted, add flour. Whisk on low-medium heat until combined for about 2 minutes (Whisk continually as to be sure it does not burn). Add 1 cup chicken stock, 1 cup heavy cream and 1 cup milk. Continue to whisk constantly until all is combined and there are no lumps. Add salt, pepper, Italian seasoning, and sherry vinegar and whisk. In a mixing bowl, add pasta, turkey, mushrooms, onion, garlic, peas, and sauce. Gently toss to combine. Transfer from the bowl to a greased 9x13 pan. In a gallon ziplock, add Ritz crackers and Parmesan cheese. Zip it tight and gently crush crackers using hands or rolling pin. Once the mixture is roughly the same consistency and size, sprinkle on top of the tetrazzini dish. Once completely covered, take 3 Tbsp cold butter and dice into small pieces. Place evenly on top of the Ritz cracker mixture. Place in oven uncovered for 20-25 until topping is golden brown and pasta is bubbling. 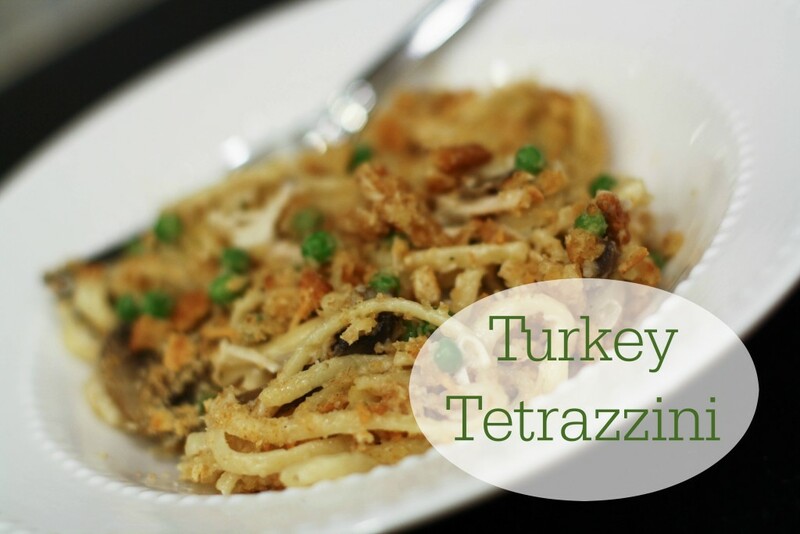 Tetrazzini reminds me of meals with my mom! Love this one. I’ll definitely have to give it a try! Thanks girl! It’s so yummy! And cooking with family is always fun! :) Let me know what you think about it! Oooh that just looks fabulous! 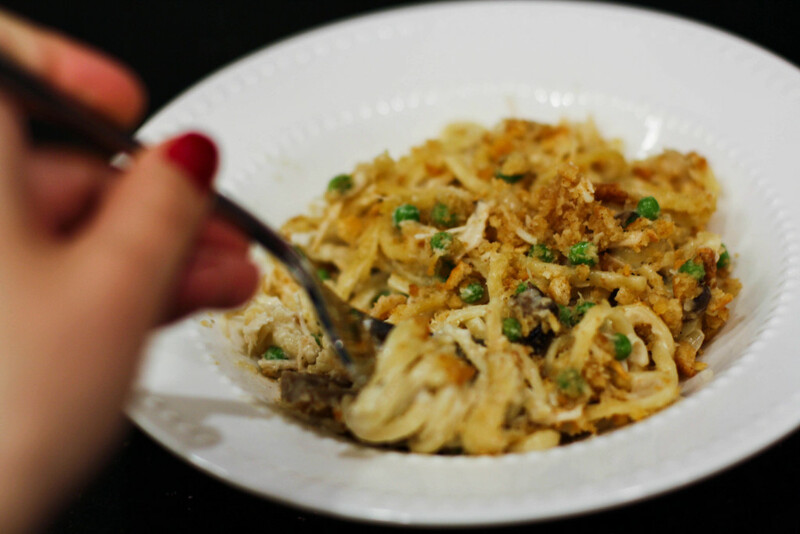 My hubby loves turkey tetrazzini – I’ll have to make this for him!